And then we came to the end (Part 2) – the last post. As I wind down this blog, it occurs to me that, as a public service, I might recap some of the things we learned for those of you who might attempt a similar endeavor someday. My goofy Scottevest jacket with the 26 pockets. For the first time in my life, I always knew where my passport was. It also had one really deep pocket that could hold a wine bottle, a laptop, and an ipad all at once, (although I looked a little like the Elephant Man when I did that). It had a little lanyard in the right pocket to which I attached our front door key. It had an eyeglass cleaning cloth on a string with a map of all the jacket’s pockets on it, in case I forgot a few. It was ugly, but it was my faithful and helpful friend. A Schwab checking account, which comes with a no-fee, no-transaction ATM card. That’s right – we were able to get money anywhere in the world with absolutely no fees whatsoever. If a foreign bank charged a fee, Schwab would refund it. That probably saved us $1000 over the course of the trip. Talk to Chuck. Frequent flier miles from United. Of the 63796 air miles we traveled, 41638 of them were free, using miles. For some of the long haul flights we used extra miles for business class, which I would never, ever, ever do if I was paying with real money. I have no idea how much money we saved, but it was a lot. Traveler’s mailbox. This is a service that scanned and opened our mail for us. They even deposited checks for me. It worked great until the United States Postal Service messed up our forwarding address, and we pretty much haven’t gotten any mail for the last two months. I’ve been too lazy to do anything about it, figuring that most of the big items have been taken care of, although there lurks in the back of my soul a low grade fear that I have missed something important. Our little kitchen kit. Over the months we’ve acquired a tidy little spice cabinet that we haul from place to place in a big ziplock bag. It includes salt and pepper, cayenne, emergency Nescafe packets, tea bags, smoked pepper (called pimenton, which we got in Argentina), coffee filters, and all manner of other culinary flotsam and jetsam. Far too many Airbnb apartments have nothing at all in the cupboard, which makes me crazy. Having a spice bag made me just a little less crazy. Uber. Uber is great. It’s invariably cheaper and better than just about any cab (although in places like Cairo or Bangkok it would be entirely unnecessary because cabs are basically free), they charge your card directly, and you don’t have to mess with a tip. Yay, Uber! Airbnb. After our first hellish Airbnb experience in New York, things settled down quite a bit. Most of our apartments were just fine and several, like in Melbourne, Athens, Prague, Siracusa, and of course, our houseboat on the Nile, were really fabulous. They’re almost always cheaper than a hotel, and you get much more room, a place to cook, and often even a chance to do laundry. The average cost was about $110 a night. If you factor in both fancy pants safari lodges and free nights at friends’ houses, our average daily housing cost was $91. T-Mobile. Before we left, we switched to T-Mobile, because they offer free international calling, internet, and text. In the entire trip, the only country in which I had to buy a SIM card was Myanmar, and that was about five bucks. Google Maps. I’ve mentioned this, but with the exception of being sent down a dirt road in the middle of nowhere in South Africa (although my navigator might have played a role in this), Google Maps was extraordinary, especially when it integrated public transit into the journey, which it was able to do in almost every city we visited (except, inexplicably, Melbourne). You can put pins in restaurants and tourist sites on your laptop and they magically appear on your phone. Then you can point to a pin on your phone and Google Maps will show you how to drive, walk, or take a bus or a subway there, and it will tell you how much time it will take. How did marriages last before Google Maps? Virtual private networks. They allow you to fool Pandora and Netflix into thinking that your computer is in the United States (or anywhere else, for that matter). There are dozens of VPN programs out there, but I used Hola and Hotspot Shield, which allowed us to binge watch The Borgia (the bad one, not the good one with Jeremy Irons). Also, I was able to use a VPN to open my Schwab account from Egypt. Ziplok bags, rubber bands, and plastic flasks. These little petroleum-based delights saved us a million and one times. You can’t imagine how many times you need a ziplok to hold papers or receipts or food items, or, well, rubber bands and plastic flasks. Rubber bands are just endlessly useful. They’re great for cords, bags of coffee, and for corralling any number of other things. I bought a bag of them at a stationary store in Istanbul. The clerk looked at me a little funny, but it was worth it. It was also about the only haggle-free shopping experience in Istanbul, which was something to treasure. We bought two plastic flasks at a travel store in Sydney. They stay sealed, they store flat, and they don’t seem to excite the x-ray people at the airport (don’t tell!). So if we had leftover hootch and we weren’t checking bags, we would distribute the illicit liquid between the two vessels to improve our chances. I only had to pour out a small bit of scotch once. Duty Free Shops – Before he started Atlantic Philanthropies, Chuck Feeney, bless him, started the Duty Free Shops. Upon leaving a country, you can unload all your leftover currency, pay for the rest with a credit card, and stock up on very inexpensive gin, which you then transfer to your plastic flasks. A portable speaker. With Wifi, VPN, Pandora, and a portable speaker, you can set the mood anywhere. The first thing people ask us, every single time, is what was our favorite destination, which is impossible to answer. I’m a pleaser, though, so here’s an attempt at an answer. If I had to name the top five or six experiences, I’d start with the lion cubs in Kruger, which made me realize how big the world really is, but also how small. The amazing thing was that the day after we saw giraffes and hippos in South Africa, we were toddling along in our RV in New Zealand. After that, I’d toss in helicoptering up to the Franz Joseph Glacier in New Zealand, floating over Capadoccia, Turkey in a hot air balloon, seeing the Temple at Karnak in Luxor, Egypt, watching the penguins waddle ashore on Phillip Island near Melboure, Australia, and sipping a scotch by the fire in the 12th century castle Traquair House in Scotland. There were many, many more magical experiences, not to mention all the really fun people we spent time with. i could easily come up with a second set of five great things, and a third, and a fourth. There’s more, lots more, but I think I’ve hit the high points. Once we got into a groove, we traveled with amazing aplomb. Each new place was an adventure, full of unexpected wonders and very little, if any, heartache. I’ve never had so much fun in my life, by a long shot. I think Janine would say the same. I am a lucky man indeed to have such a wonderful wife. Have I left anything out? Do you have questions? Feel free to send me an email or post questions in the comments area and I’ll try to answer them while I can still remember any of it. Finally, thanks for reading, friends. It’s been a wonderful journey, made all the more rich by being able to share it with people I love through these pages. I’ve really enjoyed your comments, your encouragement, and your friendship. I hope you’ve had fun too. See you at the Turkish bath! Where do I begin to end this story? We’ve been traveling for nine months out of a single suitcase. I’ve been wearing the same two pairs of jeans, the same two pairs of shoes, and yes, the same five pairs of underwear. We’ve slept in 69 different beds (if you also include airplane and bus seats as beds). We really miss our dogs and our cat, our cute new apartment in San Francisco, and especially our friends and family. And of course we miss our daughter, although we would have missed her just as much if we had stayed home, seeing as how she went off to college. With all that, we’re not the least bit ready to be home. But here we are. A number of people wrote me at the beginning of this adventure to say that they couldn’t imagine spending nine months in such close quarters with their significant other without killing each other or running out of things to say, or both. I’m happy to report that this didn’t happen to us. Oh, yes, we bickered once in a while, mostly about really stupid stuff (we once had an argument about how to zip up a suitcase), but we are unquestionably as close as we’ve ever been. During the past nine months, we always had something to talk about. Often it was about where we’ve just been or where we were about to go, but just as often we talked about the future and all the fun we still have in store for us. We talked about our daughter and our twenty seven years together. We reminded ourselves how we’ve always taken risks. We quit our jobs in Hollywood and went back to school. We moved to Japan and then DC and then back to California. We quit our jobs again, sold our house, and went on a world tour because it sounded exciting and because it was the sort of thing people only talk about doing. We’ve reinvented ourselves four or five times, and we’re about to do it again. More than anything, though, we’ve had fun. Lots and lots of fun, and we’re both sad to see this little escapade come to an end, because it’s been just magical. People have said that it was brave to do what we’ve done, but I’m not so sure. I think it’s a little more like eating dessert first. It’s unconventional, but I don’t think there will be any lasting negative side effects. I also think that there is room in almost anyone’s life to eat dessert first. Obviously, a trip like this may not be in the cards for everyone, but you might be surprised to learn what you’re capable of. I’ll be very curious to discover what life will be like when we reenter society. Will we slip right back into the old rhythms and the old grind? Somehow I doubt it. Will we want to settle down and sleep in the same bed for a while? Maybe for just a little while, although believe it or not, we’re already starting to think about when we can do it again. Next time: A long list of things we learned, stuff we couldn’t do without, and a very brief recap of highlights. A bucolic Thai beach, full of unsmiling, tattooed, European bodybuilders. After several joyful days in Bangkok, we decamped for the beach. The water was lovely, the hotel was charming, and the guests were, how shall I put it? Weird. 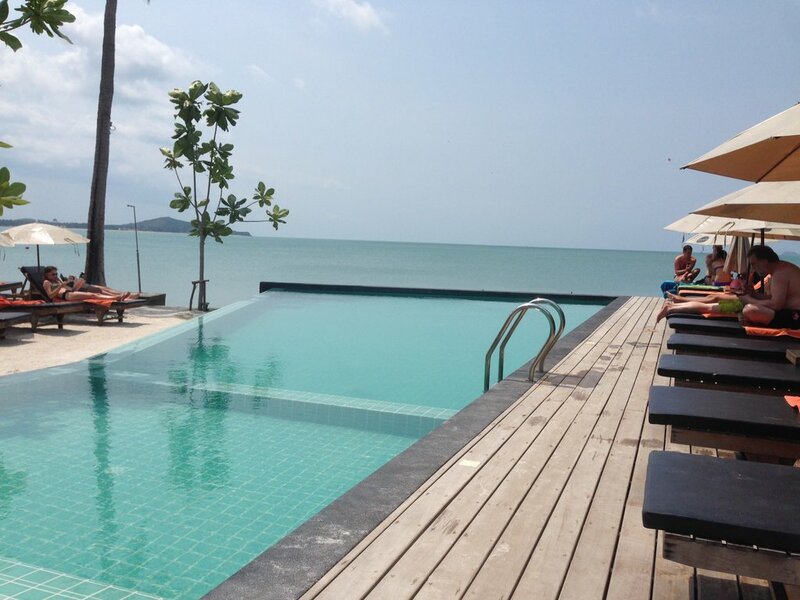 We spent four days at this charming little beach resort on Koh Samui, a perfectly good island off the east coast of Thailand in the South China Sea, but I am left scratching my head about why so many strange people are attracted to this place. For starters, there seemed to be a disproportionate number of Eastern European body builders. There was one couple, covered head to toe with tattoos, who kept their kickboxing apparatus on the bench in front of their room. We never actually saw them beat each other up, but that seems to be their hobby. They’re both ripped up like, well, Herr and Frau Universe. And they never seemed to speak. Herr Universe would wade out into the water and put his head down and stand there for twenty or thirty minutes at a time, just pacing back and forth in the water. Then he’d hop onto a small floating pier and pace back and forth some more. Either he was thinking very deep thoughts or he was searching in vain for a contact lens. Another woman who might have been Turkish or Russian walked around the property photographing or taking video of herself with her selfie stick almost constantly. Then there was the other unsmiling bearded gentleman with the prohibition-era haircut (y’know, shaved on the sides but the top flops downs over it) who sat in the restaurant staring ahead (or occasionally at his ipad), his leg in constant motion, as if he were stomping on imaginary cockroaches. Every so often his female companion would sit down next to him, but he seldom seemed to notice. There were a few European-looking gentlemen of a certain age accompanied by what appeared to be non-European women not of a certain age. There was another guy with a big Smith Brothers beard and a man bun who looked like he should be pouring cocktails in Bushwick. He never smiled either, or made any obvious expression. And then there were our roommates. Well, they might as well have been our roommates because the walls provided shockingly little noise reduction. The fellow never spoke. His significant other had a Midwestern accent out of the movie Fargo, which we were easily able to identify as she carried on an extended Skype call late one night. The next morning she was rather less articulate, but no less noisy. Happily, they were quick about it. The sunbathing rituals of the resort’s inmates were impressive. Each morning, round about 8ish, the guests would scope out their chaises, put a towel or some other item that marked the property as theirs, and then have a quick breakfast before returning to their claimed territory, where they would proceed to crispify themselves for the rest of the day. Many of them turned purple before our very eyes. If I had some extra money I’d invest it in German skin cancer clinics. A perfectly nice beach resort in Thailand. And as bizarre as this sullen, territorial, tonsorially unusual assembly of Teutonic sun worshipers was, the staff was warm, welcoming and gracious. I would not be surprised to learn that they hire zen masters to work at Koh Samui resorts, just because normal human beings would surely go stark raving mad. Despite the cultural gulfs between us and our fellow guests, Janine, our friend John (who joined us at the beach) and I had an embarrassingly good time. We kept ourselves quite busy by moving with alacrity from the restaurant to the beach to the pool, never pausing long enough to seem lazy. And we were quite responsible in our appetites as well, almost never drinking beer before noon. One day we even ventured into what passes for town. Why, you may ask, would we waste the opportunity to take advantage of the myriad cultural opportunities that Thailand has to offer in favor of a prosaic trip to the beach with a menagerie of semi-disgruntled European melanomics? Well, John was cold after a cruel East Coast winter, and after seven months of busy, culturally thoughtful travel, we had hit the sweet spot between tired and lazy that cried out for a restorative trip to the beach. I’m happy to report that it appears to have worked. London and environs – Mr. Elgin, give back those marbles! Our absolutely, positively, last castle in Scotland. Haggis, Neeps, and Tatties – an Edinburgh delight!